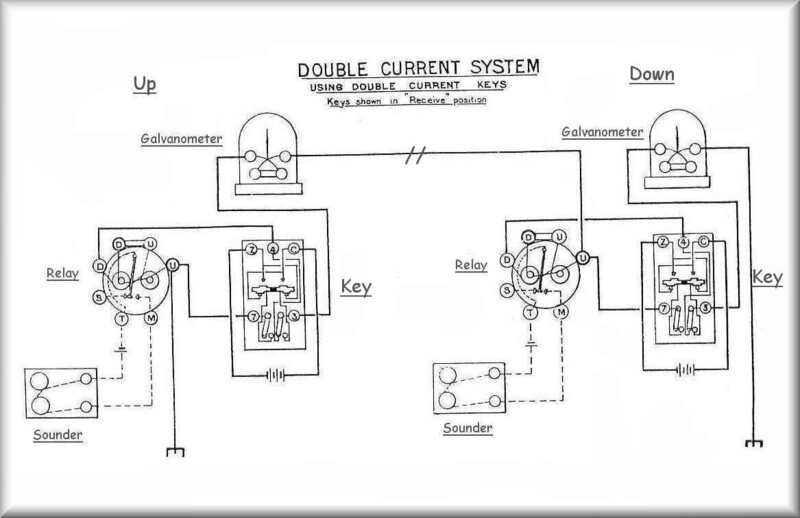 GPO Double Current & Single Current keys. 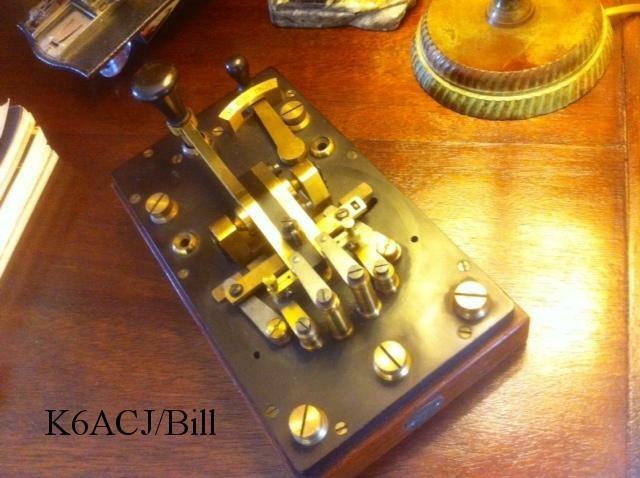 001......This rare GPO 7 Terminal Double Current Key with Send/Receive switch, dates from about 1860. The serial number is GPO 6. 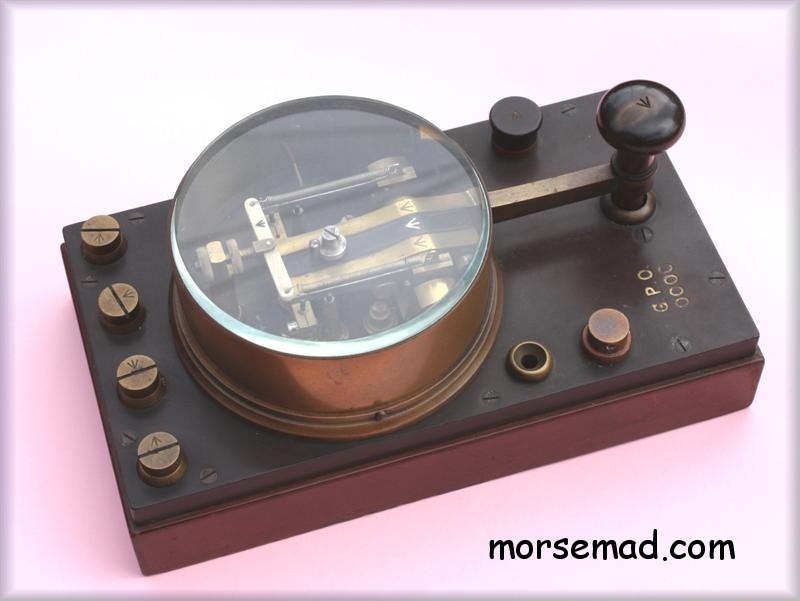 Used for transmitting morse code over land lines in the 19th century. 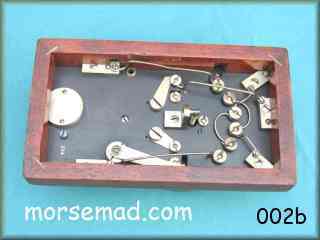 Mike / M0DVO adds: "This type of key is a Double Current Key, but achieves the polarity change by swapping between two batteries which have commoned opposite poles". 002...... This classic style GPO Double Current Key has the grand glass round top. c 1906. Dennis Goacher / G3LLZ informs that there are Mark 1, 2 & 3 keys. (Mk 1 from 1885). The mark one has a glazed top to the cover and Capstain terminals (later ones had cheese head terminals). The mark 2 has a solid brass cover and cheese head terminals, and the mark 3 has a solid cover and milled terminals. (This could vary enormously as parts were sourced during production or replaced during servicing). Keys for the military usually had solid covers and were stamped somewhere with a broad arrow, however, the GPO used a broad arrow ID too to indicate "Government Property" (thanks to George Saunders for that info). Key Drawing. 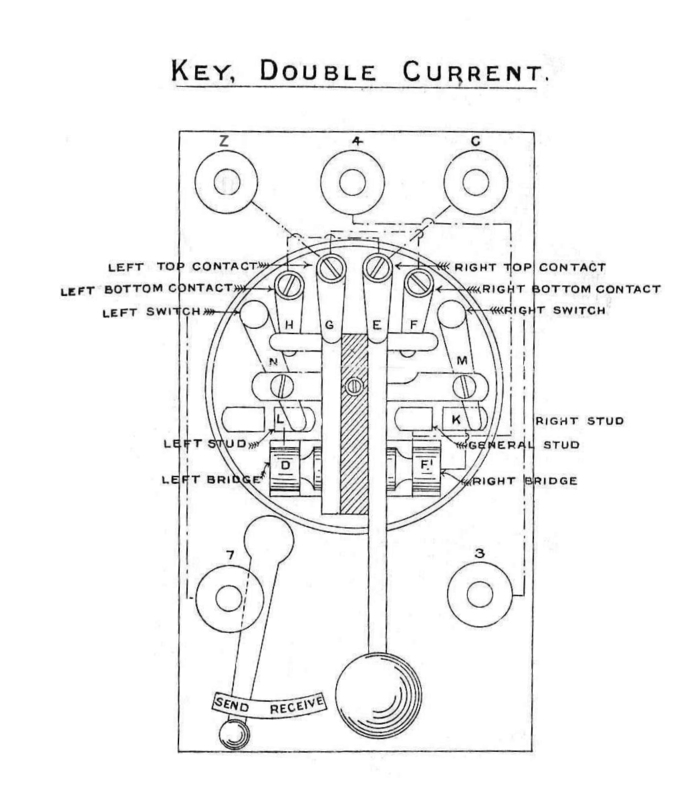 Above is a drawing showing the contacts and general layout of a typical Double Current key. "Atlantic Cable" Treasure Trove of information. Circuit Diagram. Here is a view of the setup of the typical circuit with both keys set to Receive. Note the addition for each station of batteries, relay, galvanometer and a sounder. 009. .....A Double Current Post Office pattern key here with no serial number, Nickel Plated for use in the colonies. Keywork is mounted on an ebonite slab, and the underframe is usually mahogany, but some makers, such as the Silvertown works, used teak wood. 010......A fine Double Current key key made by H. White & Co. 1918. 011. .....GPO Reversing or Increment Key. (Very rare Development key). A 6 terminal key with serial number 0000. 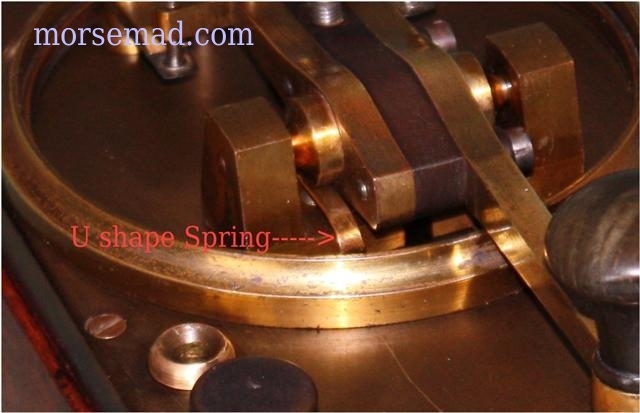 This type of key is known as a Reversing key - a key used for altering the strength of the current in a Quadruplex system. The contacts always short-circuit in passing from the upper to the lower position & visa versa, and cannot be arranged to break circuit. Note the six terminals in all and no Send/Receive switch. The glass topped cover is (unusually) held in place by two small screws. As this is a Development key with s/n 0000, it is very rare. 011. .....Every part (there are over 90 parts making up this key), including nuts and bolts and small wood screws are stamped with the Government Property broad arrow. Obviously no expense spared on this marvelous key. The only parts not stamped are the three springs ! Even the knob made of horn is stamped with the arrow. This key is what Dennis Goacher describes as a "DEVELOPMENT" key. "The term Development Key refers to the time when a key assembled to the correct tolerances was made available to the instrument makers as a reference standard, against which any parts made or repaired could be compared. An early form of quality control." Dennis Goacher. 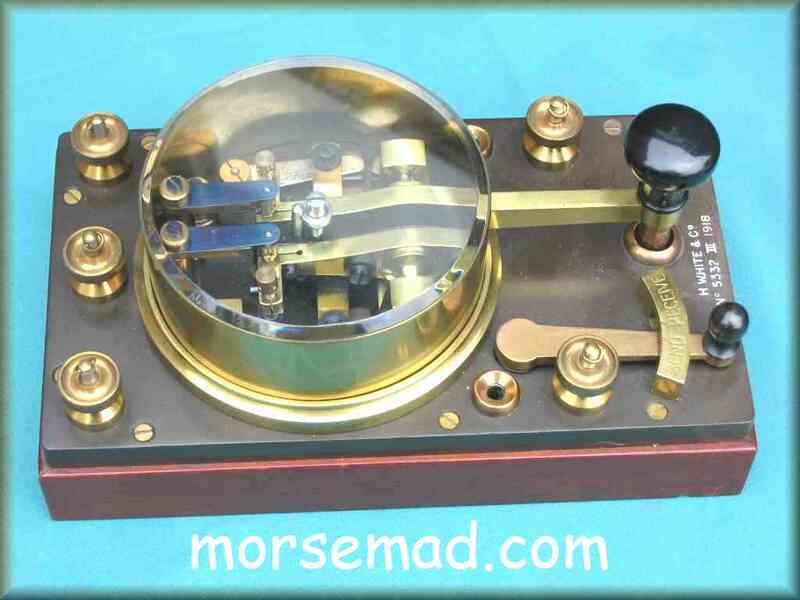 Quote from Dennis Goacher G3LLZ: "From the early days of telegraphy a need arose for increasing the capacity of the lines connecting the stations, the final result for morse telegraphy being the Quadruplex system in which two messages are simultaneously sent in each direction, making four messages in all along the same wire". "The principal used to differentiate between the two sets of signals that are going in the same directions, that one set is transmitted by means of Reversed Currents (double current working), and the other by changes in the strength of the currents (single current working). The receiving instruments are such that one set is polarised and responds only to changes in the direction of the transmitted currents, whereas the other set is non-polarised and responds only to changes in the magnitude of the currents, being indifferent to changes in direction". Dennis Goacher. "A. STROH" LONDON. 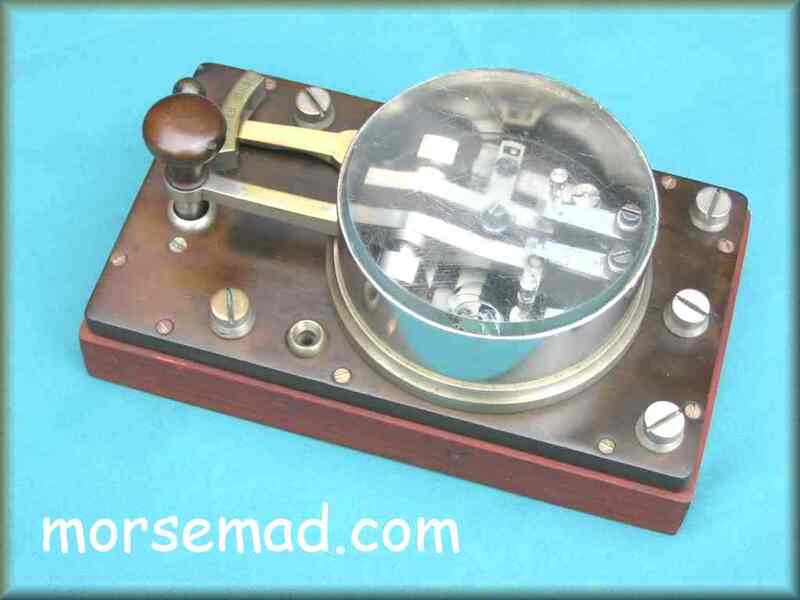 DOUBLE CURRENT TELEGRAPH KEY c1868. 062. 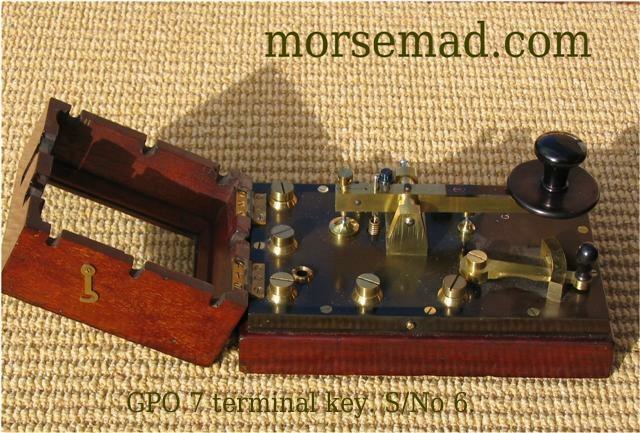 .....GPO Double Current Key labelled "GPO No 62". 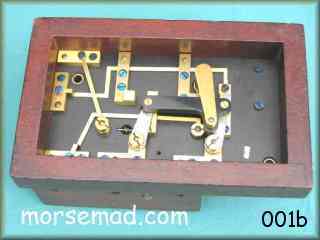 A beauty of a morse key in lacquered brass with a superb mahogany (or is it rosewood ?) base. The base measures 8 & 1/2" by 5" (215mm by 125mm) The design is quite unique as you can see by the photos, with the whole arm swivelling between SEND and RECEIVE. "STROH Patent key. London c1868. Augustus Stroh, born 1828 was a German emigre to London and among other things, was the inventor of the "STROH VIOLIN". 062b. ..... On the right can be seen a photo of the key in the RECEIVE position. Moving the complete arm, including the two middle contacts on their V shaped mounting (with two coil springs), over to the SEND position, lines up the upper and lower contacts, enabling keying. On the front edge of the base is etched "CITY & GUILDS (ENG.) COLLEGE E.E.D. K10". This key is also suprisingly light and nimble in use. A rare beauty ! 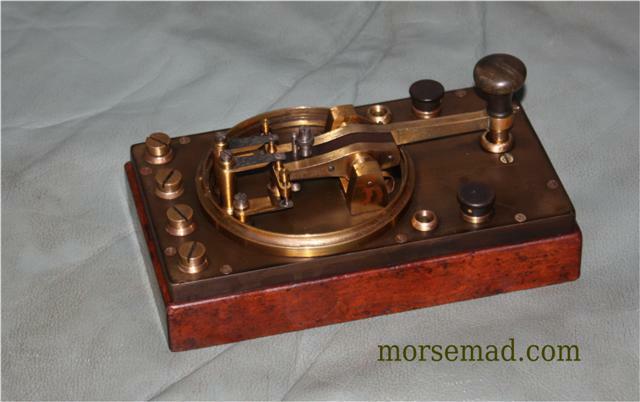 "A. STROH" DOUBLE CURRENT TELEGRAPH KEY c1868. 62c. 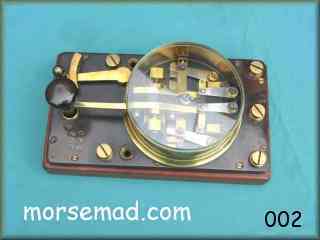 .....GPO Double Current Key labelled "GPO No 157. A fine example of the rare "STROH" Double Current key complete with its round glass topped cover. Photo - Gary Capek / K8BN. 218-3. .....GPO Reversing Key (Silvertown Pattern No. 1227) labelled "GPO 218 3". A six terminal reversing key with one or two unique features. The most interesting being the two "U" shaped continuity springs. The whole key can be used as a reversing key, or either half as an increment key. Contacts can be arranged either to break contact or to short-circuit when passing from the upper to the lower position, and vice versa. All main parts are stamped with a "3", this would indicate a Nr.3 Prototype key. 218-3-2. ..... Here can be seen one of the two unusual "U" shaped springs fitted to improve electrical continuity. 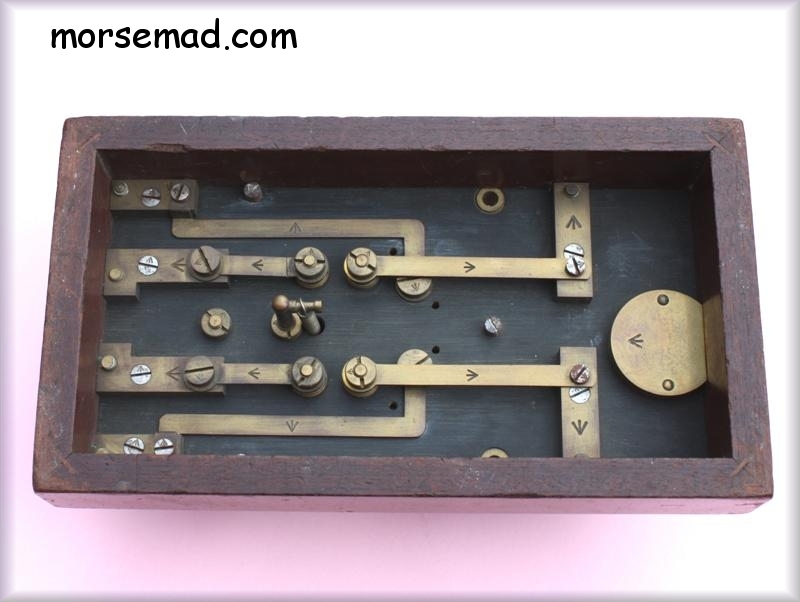 GPO AUTOMATIC DOUBLE CURRENT KEY. 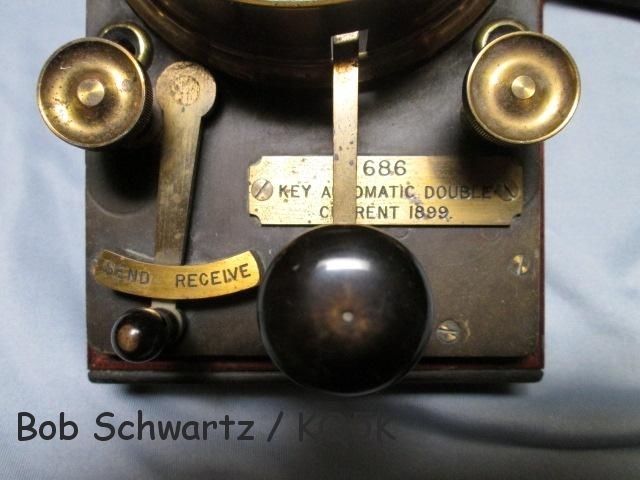 686 Pictured above is an interesting "AUTOMATIC DOUBLE CURRENT KEY c1899. 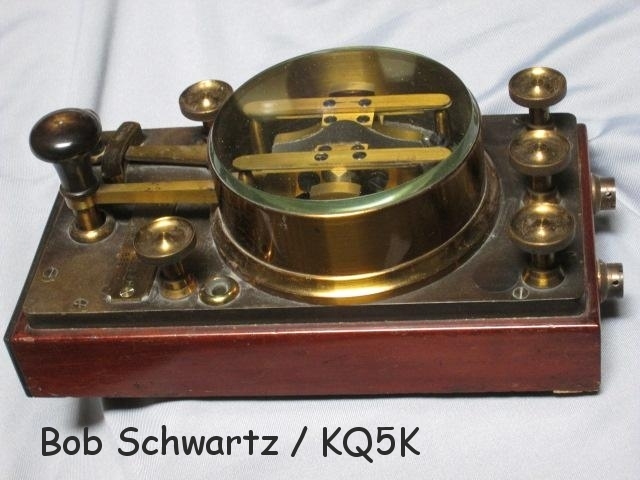 Owner Bob Schwartz / KQ5K sent me photos of this unusual variant of a GPO Double Current Telegraph Key. 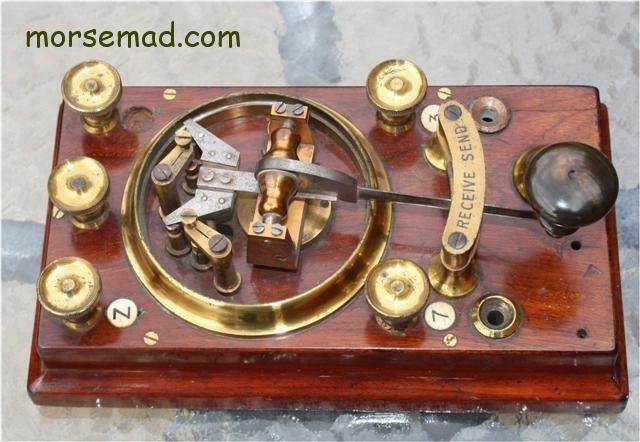 First one I have seen, this is a telegraph key with two extra terminals connected to an electro magnet mounted in the base that allow the key to be remotely keyed. 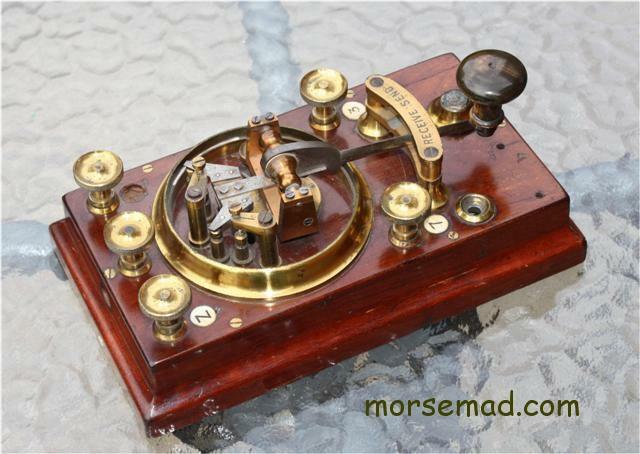 So one master key could key two or more of these keys, each keying a signal on a seperate telegraph line. I you have any info to add please email me. 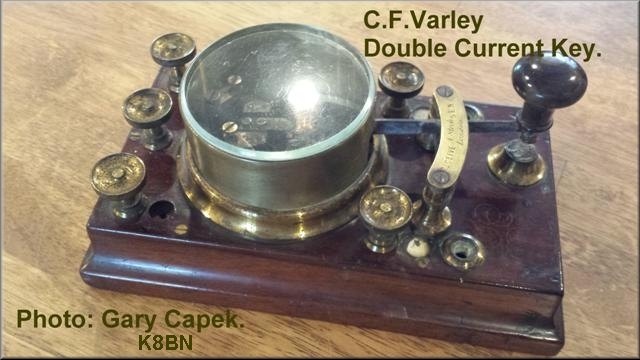 TWO WAY DOUBLE CURRENT KEY QSO ACROSS THE POND AND BEYOND. Feb. 2014 on 21.050MHz. Bill/K6ACJ in California USA and myself - John/G0RDO in SW England, UK, had a fun QSO on CW where we were both using GPO Double Current keys. Pictured above on the left is Bill's ATM Ltd key serial number 1555, manufactured in Liverpool, England c 1910, and on the right my H. White & Co key No 5332 III, England c 1918, both of these keys were used in the contact. 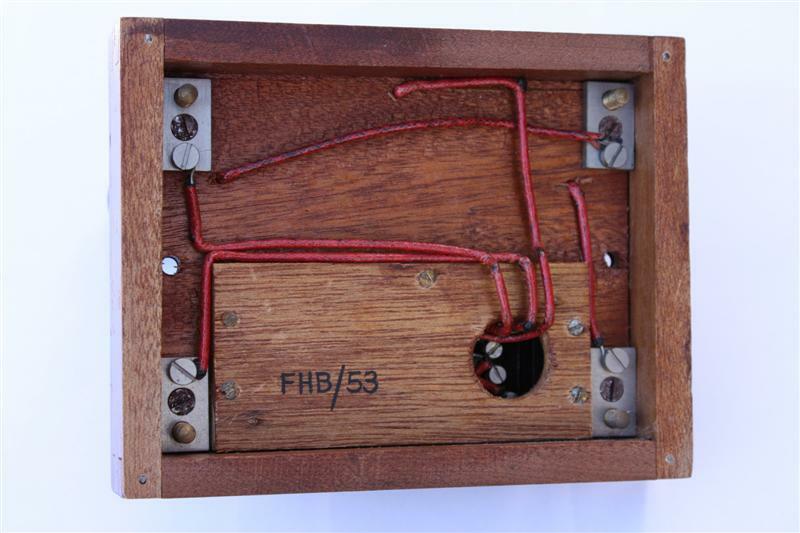 053.....This fine scarce GPO FHB-53 Key with Send/Receive switch, was the successor to the big double current keys. 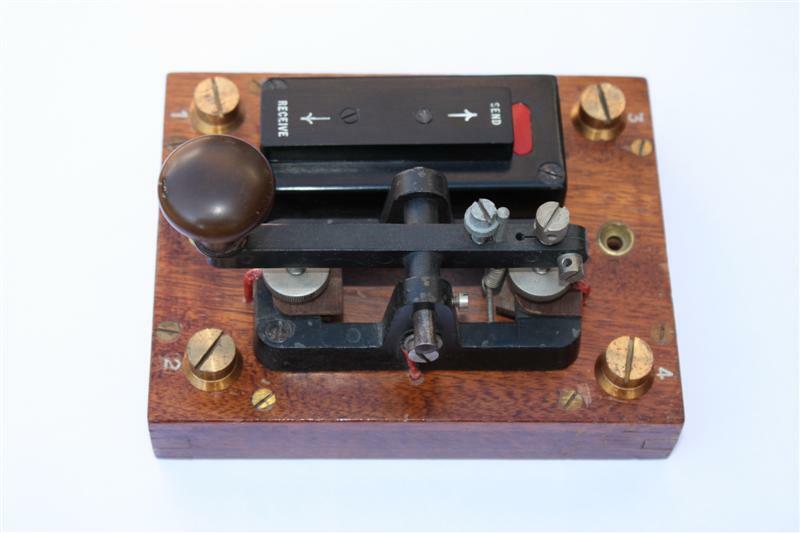 The key itself was made by Signalling Equipment Ltd. England, and designated the model: Type "F-17"